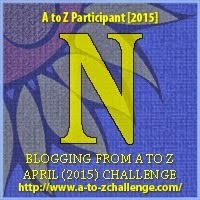 The letter N in my reasons to be cheerful Blogging from A to Z Challenge takes us, as you no doubt realise, just past the halfway mark. If you're still jogging along with me I'm really pleased - in fact, it's another reason to be cheerful - and I'd just to like to remind everyone AGAIN that I welcome comments. The opportunity to comment on each blog post is at the bottom so give it a go. So far, I don't think I've come up with a particularly political reason, but all that could change with N which is the National Health Service of the United Kingdom. I absolutely and utterly believe that the NHS is a reason to be cheerful and one that we in Britain are in danger of letting slip through our fingers. 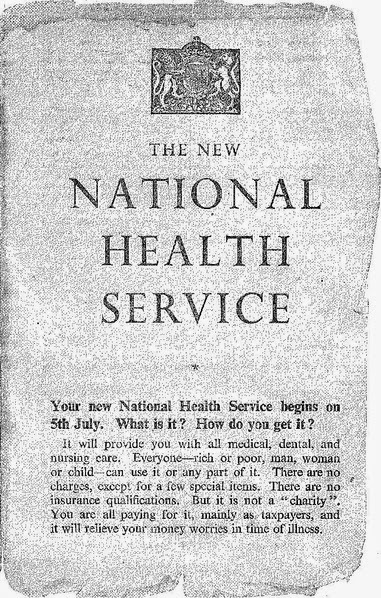 Set up in 1948, the NHS provides a comprehensive range of healthcare the vast majority of which is free at the point of use having been paid for by taxation. The best explanation I can think of for the rationale of the NHS comes from Labour politician Nye Bevan, who was Health Secretary at the time the NHS was founded. He said: "Illness is neither an indulgence for which people have to pay, nor an offence for which they should be penalised, but a misfortune, the cost of which should be shared by the community." I fully accept that the NHS is a costly and flawed organisation which needs to be improved, but I find it difficult, not to say impossible, to accept that privatisation in its various forms is the way to bring about that improvement. Some may call it the introduction of private enterprise, I would describe it as finding ways to make money out of other people's misfortune. While I would lay much of the blame for this approach in the NHS at the feet of the Tories, it has to be said that previous governments of all political persuasions have done little to enhance the NHS. The infamous private finance initiatives imposed on the NHS have, in my view, been a colossal disaster, resulting in NHS money going to banks and equity investors rather than being used on patient care. I know many people, in my family and elsewhere, who have benefited from NHS treatment and I suspect there is a growing possibility that in Britain we are at risk of taking the service for granted. Thanks to the NHS the time when falling ill was not only a worry in itself, but also led to the added burden of trying to pay for treatment, is becoming a receding memory..
Nye Bevan has been dead more than half a century, but it would be a crying shame if another quote from him came to be applied to us now. "No society can legitimately call itself civilised if a sick person is denied medical aid because of lack of means." Let us hope that never comes true. We might need a bit of music to cheer us up after all that, so here's Dr Feelgood performing Down at the Doctor's. I'm fairly certain it's not about a medical appointment, but never mind, eh? Question: What would you do to improve the NHS? We're constantly having those debates in Canada, too. Whether it's doctors wanting to make more money from private pay patients, or the rich folk getting irked about having to be waitlisted with the hoi polloi, it all comes down to the haves advocating for a two-tiered system so they can have even more. We end up with cuts to healthcare that never seem to slice through the layers of bureaucracy, but manage to do and excellent job of cutting services to the people who need them. On the bright side, loved the music! Thanks for that. Hi Mark - I don't really use the NHS - oddly I have this year for my hip, which decided it needed to be changed (but that was a birth defect) ... but I think people don't help themselves ... if we didn't use the NHS for unnecessary things and waste health workers time .. the NHS would be in a different place, and so would the country ... we're far too dependent on others, and don't think for ourselves. Missed a few days, Mark but catching up now. Your J posting hit the mark & encouraged me to put together a sherry trifle at the weekend. Sherry trifle is not trifle without a layer of jelly and it was scrumptious! Now the NHS. You have seen some of my postings on Facebook & you'll know I agree wholeheartedly with the sentiments here. I believe proper reform, without political dogma & financial vested interest, is essential. This, to me, means a streamlined PUBLIC service. I could go on & on but I'll close by endorsing the music track - fantastic!! I know health care for all is under siege. I hope we come up some way to continue giving help to those who are ill and haven't the means to pay for the care they need. We are struggling with this issue in the USA. I don't know exactly where I stand. I think people should be taken care of but the government is all of us. And we are already paying a lot to take care of all of these people. I just wish I knew the right answer! I am envious of anyone that has access to a national health system, even with the flaws. I live in the States, where something like 60% of all bankruptcies are related to health care costs. Although I have health insurance paid for in large part by my employer, I still live in financial fear of a serious illness, as for profit insurance companies often find ways to deny services. It's all about profit, you know. Even at the expense of our health. Shameful. Usually I try to reply individually to people who make comments on my blog, but in this instance I'm making a general reply to avoid repeating myself. Sorry if that seems like laziness. I have been very struck by the warnings from those of you in the USA and Canada about the way providing health care can lead people in to massive debt. This is something that people in Britain should bear in mind as we approach next month's General Election in which the future of the NHS is very much a key issue. Not surprisingly every political party claims that the NHS will be safe with them and talks of some very grand spending plans. I think people need to be very careful about how and why they cast their votes in May. I would never claim that the NHS is NOT in need of some fairly drastic improvements and, yes, we the patients can do a lot to help by considering whether we really need to see a doctor or whether a couple of over-the-counter painkillers is all we need to ease the symptoms of a bad headcold. However, my main point remains that we are at risk of losing a service paid for by taxation across the board which provides care that some people could never afford. A friend of mine had heart bypass surgery a few years ago and would almost certainly have died because on the quite low-paid job he had - and has now been able to go back to - health insurance premiums would have been completely beyond him. The former partner of another friend of mine recently travelled to Britain from the USA to visit family in the UK. This person has serious health problems not the least of which is a psychiatric condition. It is arguable that this led to him travelling across the Atlantic when he should have stayed at home. Nevertheless, he arrived in the UK and it was soon realised he needed a lot of care before he might even be able to think about going back to the USA. This he received and, as my friend told me, "it didn't cost him a cent". Clearly, it did cost the UK taxpayer some money, but again my point remains that when you are ill you need looking after without having to worry about your finances. Sorry to go on, but I have been very gratified at the considered responses to this post. As you know, I welcome comments. I would also like to give a shout-out to the Greek health system, from my admittedly limited experience a miracle in action given the current situation.